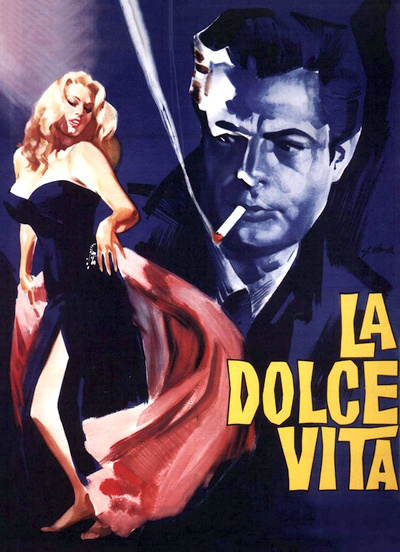 There is hardly another film in the history of Italian cinema that is as influential and as highly regarded as the classic La Dolce Vita (1960). Directed by one of the icons in European cinema Federico Fellini La Dolce Vita follows the young reporter Marcello Rubini (Marcello Mastroianni) during his search for the ultimate story. Marcello is captivated by the glimmer of aristocratic night life and often ends up experiencing what his stories aspire to describe. But he hardly ever feels satisfied...the rampant never-ending parties, the pretentious aristocratic chatter, even the seductive women which he encounters, they all feel the same, their "stories" have already been told. Until one day the beautiful movie star Silvia (Anita Ekberg) arrives in Rome. • The Eye & The Beholder - presented here is a new visual essay which focuses on the framing and camera movement in La Dolce Vita and offers visual comparisons between different sequences from it and similarly framed sequences from other classic films (Francois Truffaut's The 400 Blows, Jean-Luc Godard's Breathless). The essay was created by filmmaker ::kogonada for Criterion in 2014. In English, not subtitled. (10 min, 1080p). • Federico Fellini - in this 1965 interview, conducted by Irving R. Levine for NBC News, Federico Fellini explains what inspired him to become a director, and discusses his experience as a journalist, his unwillingness to discuss the messages of his films, the enormous impact Charlie Chaplin and Roberto Rossellini's work had on him, etc. In Italian and English, with optional English subtitles where necessary. (31 min, 1080p). • David Forgacs - in this new video interview, film scholar David Forgacs discusses the socio-political climate in Italy at the time when La Dolce Vita was shot, its unique themes and narrative structure. The interview was conducted exclusively for Criterion in June 2014. In English, not subtitled. (15 min, 1080p). • Lina Wertmuller - in this new video interview, Lina Wertmuller (All Screwed Up, Swept Away), who began her career as an assistant director on Federico Fellini's 8 1/2, talks about the great Italian director's legendary sense of humor and his relationship with actress Giulietta Masina (La Strada) and special bond with Marcello Mastroianni, and discusses Anita Ekberg's image at the time when La Dolce Vita was shot as well as the film's final sequence. In Italian, with optional English subtitles. (8 min, 1080p). • Antonello Sarno - in this new video interview, Italian journalist Antonello Sarno discusses the unique atmosphere in the Eternal City during the late '50s and early '60s, Federico Fellini's relationships with producers Dino De Laurentiis and Angelo Rizzoli, production designer Piero Gherardi's invaluable contribution to La Dolce Vita, and the dolce vita fashion trends the film inspired. The interview was conducted exclusively for Criterion in June 2014. In Italian, with optional English subtitles. (16 min, 1080i). • Marcello Mastroianni - presented here is an archival audio interview, the legendary Italian actor recalls his initial encounter with Federico Fellini, and discusses the different characters he played in his films as well as the unique relationship between fantasy in reality in his body of work, his fascination with science fiction, the invaluable advices the Italian director always had for him, etc. The interview was conducted by film historian Gideon Bachmann in 1963. In Italian, with optional English subtitles. (48 min, 1080p). • Felliniana - presented here is a selection of La Dolce Vita ephemera -- including posters, lobby cards, and press books -- taken from Don Young's massive collection of Federico Fellini-related memorabilia, the Felliniana Archive. (1080p).